Kristen Stark initially ignored the email. Michele Vogel received the same one and read it three times to make sure her eyes and brain were on the same page. 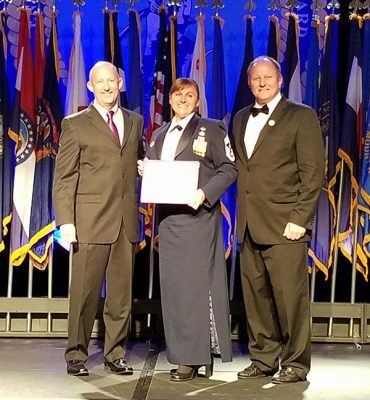 Michele Vogel accepts her scholarship from Stephen Smith (left), GCU’s director of military affairs, and John Harris, president of the Enlisted Association of the National Guard of the United States (EANGUS). 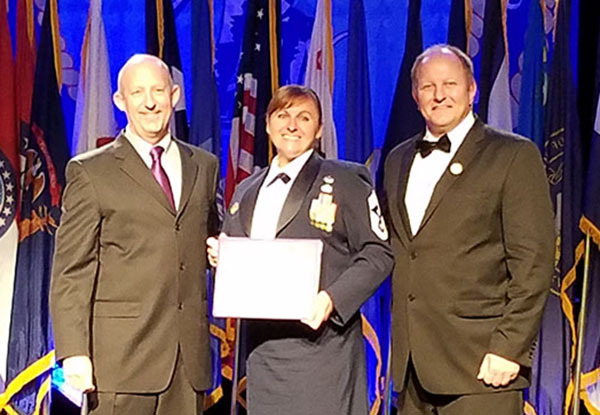 Stark, a 34-year-old neo-natal intensive care nurse in Arkansas, and Vogel, a chief master sergeant who is the 175th Wing Command Chief of the Maryland Air National Guard, were selected for the “We Care for America” full-tuition scholarships toward any Grand Canyon University bachelor’s or master’s degree program. Each received their awards from Enlisted Association of the National Guard of the United States (EANGUS) during the recent All States Banquet and Awards Program in New Orleans. Each wrote an essay about what career goals she would pursue through this educational opportunity and why GCU would be the best fit for her pursuits. Vogel hadn’t heard of GCU until she saw the scholarship contest in an EANGUS quarterly newsletter, is in the Master of Science in Leadership program. Stark, who heard about this opportunity because her husband is in the military, has begun pursuing her RN to BSN degree. Their respective paths helped earn these scholarships, but it wasn’t easy. As a neonatal nurse, Stark works two overnight shifts per week and has an 8-month-old son, Beckett. Two summers in Rwanda several years ago opened her eyes to the medical field. 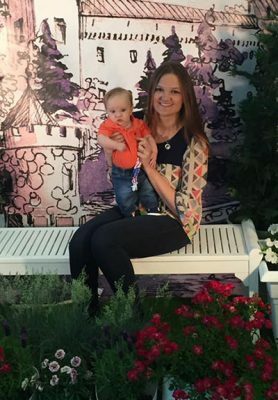 After she dabbled in dietetics and nutrition, her path toward neonatal care (mothers and newborns) was partially inspired by two miscarriages a few years ago. “You don’t realize how strong you can be until you go through that,” she said. She was aware of GCU’s reputation as an elite school for nursing and health care, so Stark plans to earn her BSN online with a long-term vision toward global travel through Mercy Ships. The organization helps provide a wide array of medical care and surgeries within countries that have poor (or nonexistent) health care, meaning she would need to raise her own salary and travel expenses. Suffice to say writing essays about herself was not a habit. Vogel quickly ascended up the National Guard chain of command, but doing so has required frequent moves from state to state for her family, which includes two teenagers. Doing so also meant a lot of online-only education in the counseling field, but many schools required a practicum or in-classroom experience before earning the degree. At GCU, Vogel will be able to earn her degree online while living in Maryland and eventually return for her certification through physical classroom or counseling experiences in whatever focus she chooses. Beyond the scholarships’ ease on the family finances, both Vogel and Stark consider themselves lifelong learners. That includes passing knowledge and experience to their next generation.